Creamy Lemon Dressing…Plus Homemade Butter and Whipped Cream! 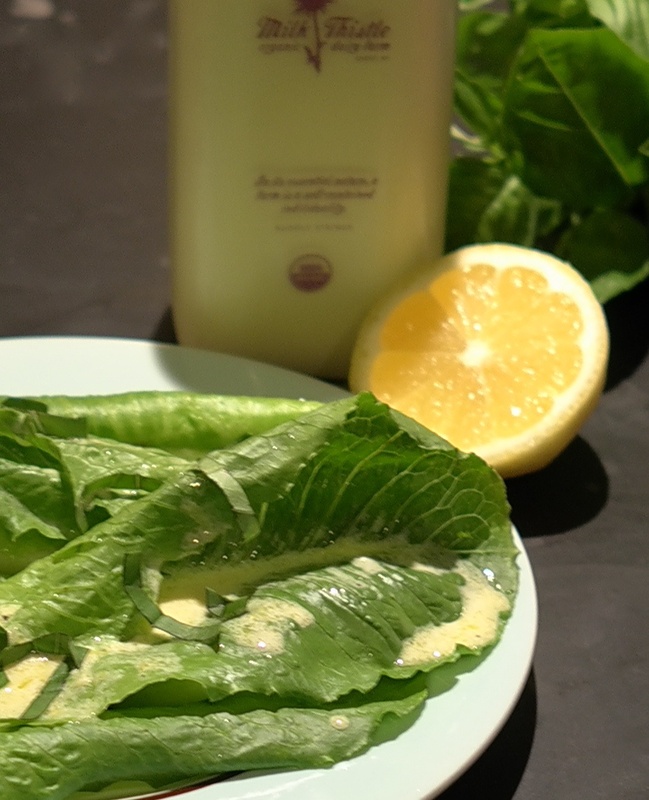 Here is another take on lemon dressing (remember the first one?). This one is Alice Waters’ version, and is great served on something as simple as romaine leaves alone. It involves heavy cream, but don’t be scared–just a small amount goes a long way. One of my favorite stops at the farmer’s market is Milk Thistle . They have different types of milk, yogurt, and cream, all served in glass bottles that you return to them. Also, once I tasted the freshness of their products, I realized what milk is supposed to taste like. Now I understand that milk is much more than just an excuse to get a milk moustache. 1. Butter: Pour room temperature cream into a jar with a secure lid, at least double the size of the cream. Start shaking. Keep shaking. With Milk Thistle cream, you only need to shake for 5-10 minutes. (I have tried this with store-bought mass-market cream and it takes longer. I have also tried this with 26 5th graders from NYC and they think it is the absolute best thing ever.) Then, the cream will turn into a ball. Shake a few more times. Then, strain out the liquid. That liquid is buttermilk, which you can reserve for pancakes, dressing, etc. Now, get back to shaking. Strain out more liquid. Add a few tablespoons of water and shake some more, then strain (once you add water you will not save that liquid anymore). Add water, shake and strain 2-3 more times until liquid runs clear. Optionally, add salt. Enjoy immediately or refrigerate. 2. Whipped Cream: Pour cream into a large bowl, and start whisking. Keep whisking until it starts to get very thick. (Apparently, peaks will start to form but since I don’t bake I just know to stop when it starts to get thicker and a bit harder to whisk.) Then, add a a little bit of vanilla and some sugar depending on how sweet you like it, and whisk a little bit more. DO NOT overwhisk or it will basically turn into butter. This whipped cream is delicious of fresh berries or any other fruit. And now, the Creamy Lemon Dressing Recipe!! Stir together vinegar, lemon zest, lemon juice, salt and pepper. Taste and adjust as necessary. Whisk in olive oil and heavy cream. Taste and adjust as necessary. Toss with greens. Optionally, top with chopped herbs you have on hand, such as basil, chervil, chives, and tarragon.